As you probably noticed already, the SIHH 2010 expo results in a lot of new and impressive timepieces by numerous manufacturers. Unfortunately, I could not make it to the SIHH and GTE myself this year, but at least I am able to track all new releases via WatchUseek, Perpetuelle, TimeZone and WorldTempus. Audemars Piguet is also exhibitor at the SIHH in Geneva and was actually the first brand that I kept an eye on, since I’ve seem to be bitten by the AP bug. 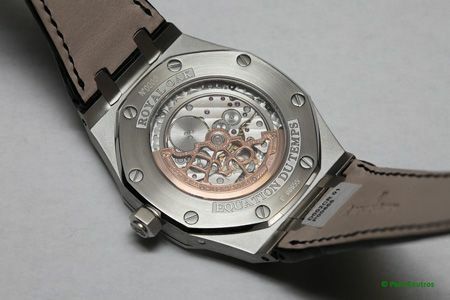 The ‘regular’ Royal Oak timepieces suits me best and not the Offshore models. 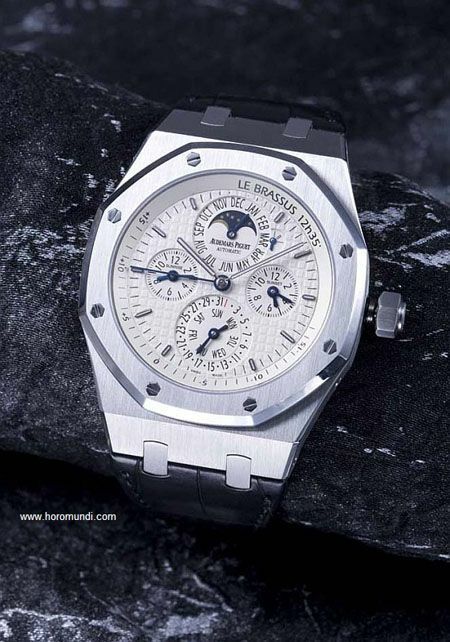 These are too bulky for me and I am not too sure about all the exotic materials AP uses for these watches. This year, I am lucky, because Audemars Piguet introduced a variety of interesting Royal Oak watches, including a non-limited skeletonized version of the 15300 model and an all new Royal Oak Equation of Time in stainless steel. Also available in gold of course, to match your yacht when you hang out in Saint Tropez. The 42mm diameter case houses an incredible complicated movement, caliber 2120/2808, consisting out of 423 parts. Base caliber 2120 is only a mere 2.45mm thick, including the rotor and all the complications added to this movement (hence the 2808 addition in the movement number) add another 2.90mm to be able to show the Hours, Minutes, Date, Day, Leap Year, Equation of Time, Astronomical Moonphase Display and the Sunrise and Sunset times for a given location. Although the equation of time probably doesn’t come to mind when thinking of a neat complication for your timepiece, at least not in my mind, it is a very impressive functionality to measure the difference between our conventional time and true solar time. For instance, if you’d measure time using a sundial, it will become apparent that it doesn’t indicate the same time as your watch, the differences can add up to 16.25 minutes. This variation is due to the earth’s elliptical path around the sun as well as its tilted rotation axis. For convenience, modern societies have calculated an average of all the days of the year and defined the mean solar day as comprising 24 hours, corresponding to so-called legal time. “The mean solar culmination point depends on your exact location, on the longitude of a given location on the globe. The equation of time read-off system developed by Audemars Piguet takes account of this specific place. Unlike most other equation of time mechanisms, it is not set to a given time zone selected by the manufacturer, typically corresponding to 15 degrees longitude. The ?¢?Ç¨?ìworld standard time?¢?Ç¨¬ù system divides the world into 24 time zones and takes the Greenwich meridian as the zero point. While the official time is thus the same across the width of each time zone, true solar time varies by four minutes per degree (15 degrees=1 hour). Therefore, although the clocks on the Bahnhofstrasse in Zurich and on the Rue du Rh?É¬¥ne in Geneva indicate the same time, true noon – the point in the day when a sundial shows no shadow, or put another way, the sun is exactly directly overhead, can be observed a few minutes earlier in Zurich than in Geneva. The perpetual calendar and sunrise and sunset complications probably need no introduction, however, the combination of all these features make this one hell of a complicated timepiece. All this, without losing the original 1972 octagon shaped bezel and case design. Audemars Piguet did an excellent job, demonstrating their master watchmaker skills and using their proven Royal Oak concept. 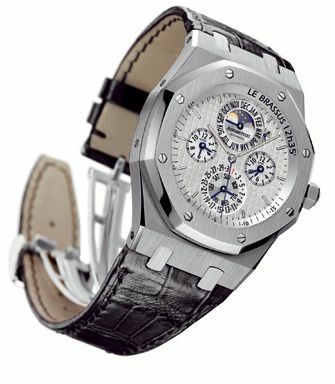 Although some people complain that Audemars Piguet is almost equal to Royal Oak (and admitted, they have plenty of other interesting collections currently), this one stands out and is hard to dispute with. No Offshore-ish design, no rubber or high-tech materials such as carbon or ceramics, just back to basics with their stainless steel case that represents the original Royal Oak model and a superb complicated mechanical masterpiece. I love this timepiece. The 26603ST (stainless steel) and 26603OR (gold) are only available on a leather strap, for now. The AP folding clasp has the famous AP monogram and comes in either stainless steel or gold. Prices will be probably published later on, when they are bound to appear in the AP boutiques and at authorized AP dealers.